(Nanowerk News) A new study shows that wind, water and solar generators can theoretically result in a reliable, affordable national grid when the generators are combined with inexpensive storage. 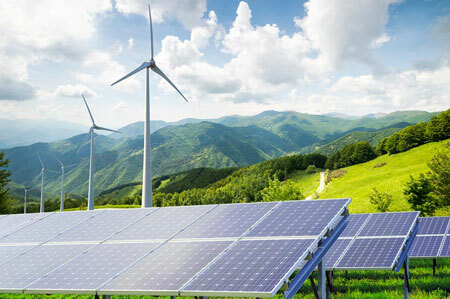 Over the last few years, Mark Jacobson, a Stanford professor of civil and environmental engineering, and his colleague, Mark Delucchi of the University of California, Berkeley, have produced a series of plans, based on huge amounts of data churned through computer models, showing how each state in America could shift from fossil fuel to entirely renewable energy. In a new study published today in Proceedings of the National Academy of Sciences ("Low-cost solution to the grid reliability problem with 100% penetration of intermittent wind, water, and solar for all purposes"), they use the data from those single-state calculations of the number of wind, water and solar generators potentially needed in each state to show that these installations can theoretically result in a reliable, affordable national grid when the generators are combined with inexpensive storage and "demand response" - a program in which utilities give customers incentives to control times of peak demand. In Jacobson's plan, hydrogen would also be used as a storage medium; during low-demand hours, excess electricity would be used to create hydrogen, which could be stored in fuel cells and used to power some vehicles. Jacobson's new model foresees, and is dependent upon, an all-electric country, with virtually everything running 100 percent on electricity: cars, trains, buses, industry, heating and cooling, and with the electricity originating from wind, water and sunlight. Jacobson's previous studies have drawn wide attention, but critics have argued that a national electric grid without power plants powered by coal for background power and natural gas to fill in gaps of supply would not be reliable. The wind doesn't always blow and the sun doesn't always shine, and batteries for the grid are not yet affordable enough for storing and managing the nation's electricity. "The utilities and others who are against renewables have always argued that the lights are going to go out, the grid is going to be unstable, and it will cost too much to keep a clean, renewable-energy grid stable and reliable," Jacobson said. "Skeptics have never studied a system of 100 percent clean, renewable energy for all purposes, and particularly one that combines low-cost storage with demand response and some hydrogen, as in this new paradigm." Jacobson, who is also a senior fellow at the Stanford Woods Institute for the Environment and the Precourt Institute for Energy, briefed a congressional panel on his research on Nov. 19. All raw energy for this system would come from wind, water and sunshine - no natural gas, biofuels, coal or nuclear power. The resulting drop in air pollution would save tens of thousands of lives each year, the researchers say. Sixty thousand to 65,000 people die prematurely in America annually as a result of air pollution. An all-electric nation could reap a number of benefits. While the cost of electricity per kilowatt hour in Jacobson's system might be about the same as electricity generated from fossil fuels, users would actually spend about 30 percent less due to the fact that fewer kilowatt hours are needed in the new system because the efficiencies of electric engines exceed those of combustion engines, Jacobson said. "You eliminate air pollution and global warming emissions, stabilize fuel costs, create over two million more jobs than are lost in the U.S., you reduce reliance on international trade of fuels, and you reduce the risk of power disruption, such as from terrorism or massive failure, because more energy is distributed over larger areas," Jacobson said. "Most energy would be local. You can eliminate a lot of fuel emissions, just because you won't have to transport oil in tankers across the ocean, you won't have to use trains of coal cars to ship the coal."